Are There Penguins in Africa? When we speak about penguins many of us visualize the beautiful penguins in the snow and ice spread Antarctica. Do you know there are penguins in Africa? Yes, there are penguins in Africa. They live in a warmer climate when compared to the other species of penguins. The penguins in Africa are also called black-footed penguins and also as Jackass penguins because of their donkey-like braying call. They stand tall with the height of 60 cm and weigh between 2.2- 3.5 kg. They are a mid-sized species. African penguins have a similar appearance to their counterparts in the Southern Hemisphere. Humboldt, Magellanic penguins in the Southern Hemisphere and Galapagos penguin in the Pacific Ocean near the equator is the African penguin’s closely related banded penguins. African penguins are found only in South Africa and not anywhere else in the world. The other banded penguins share similar color, behavior, and size. The African penguins have a black back and white front. The white front has a black stripe with some spots which are in the shape of a drawn U-turn. The spots on the African penguins are unique from each other. However, the black and white body works as camouflage when the predators find them in the water. African penguin has a pointed bill. There is a pink gland above the eyes which helps them to cool the body during warmer conditions. The hot blood is passed to the pink glands to cool down by the surrounding air and thus it aids in tolerating the temperature. As the name says the feet of the African penguins are black and webbed. The male African penguins are taller and have long beak than the females. 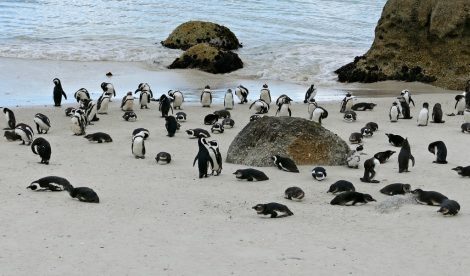 Where can we find the African penguins in South Africa? African penguins are found on the south-western coast of Africa. They are present in the colonies of over 24 islands proximate to Port Elizabeth in South Africa. There are two colonies specifically Boulder’s Beach and Betty’s Bay near Simon’s Town and Stony Point that is close to Cape Town. Namibia colony is quite good in their stay whereas, the Betty’s Bay colonies have been threatened by Leopard. We can also find them in the St Croix Island in Algoa Bay. 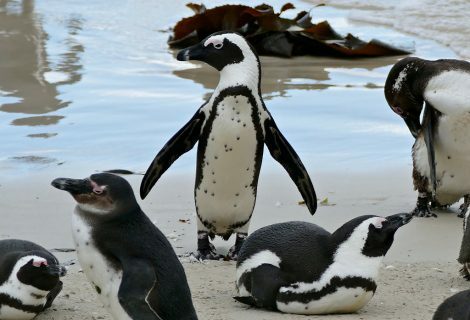 The main significant places to see the African penguins are St Croix, Dassen, Robben, Bird and Dyer Islands. Boulders beach is one of the best places to swim along with the African penguins and meet them close since they are unafraid of humans. Apart from the colonies on the South-Western coast of Africa, African penguins can be found in the zoos globally. African penguins prey on small fishes such as Sardines and Anchovies along with the squids and crustaceans. They lay eggs in guano, bushes or scrapes in the sand. During molting season like other penguin species, African penguins also fast and doesn’t swim in the water. The penguin under captivity can live until 30 years and the life in the wild can be up to 27 years. Shark and fur seals are the major predators of the African penguins. Mongooses, caracals, Cape genets, kelp gulls and cats can be a great threat while nesting. Leopards and orcas are also two of the occasional predators of African penguins. Due to their easily adaptable nature over temperatures they can be kept in any zoo. The effort to maintain the temperature is nil since they don’t demand the low temperatures. They can breed easily in warmer regions unless other penguin species. They are commonly found species of penguins in the zoos across the world. Since there is a lot of human threat to the African penguins, like picking up the eggs for food and destroying their habitat makes them an endangered species.